This is just a little update. I haven’t stopped in to add anything here in a while but that doesn’t mean I’m not still publishing and handing out copies of Words For Warriors. As a matter of fact, I just got a new letter from an adorable 10 year old girl that I included in the latest printing. If you want to add a letter and a photo or two to for the website and/or book, please submit it to words4warriors1@gmail.com. This is a “community” project and additional participants are always welcome. *By the way, I’m looking for a few good Army Rangers! I want to give a couple of books to Ranger veterans specifically, so if you’ve got a suggestion for someone to send a copy to, I’m all ears. At this time of year, I always stop and say a special prayer for all our troops who won’t be able to be home for Christmas. 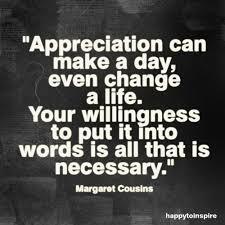 My hope is they know that their hard work is appreciated! I’m pleased to report that I’ve been able to set aside enough money to print another batch of books. I’m extremely happy with the Second Edition but I think it would be nice to collect some new letters to be included in the next printing. Now that I know approximately when I’ll be publishing additional books (mid-July/early August), I will see about soliciting some fresh letters and photos. It’s nice to have a target date nailed down for the next phase of this project that I love so much! 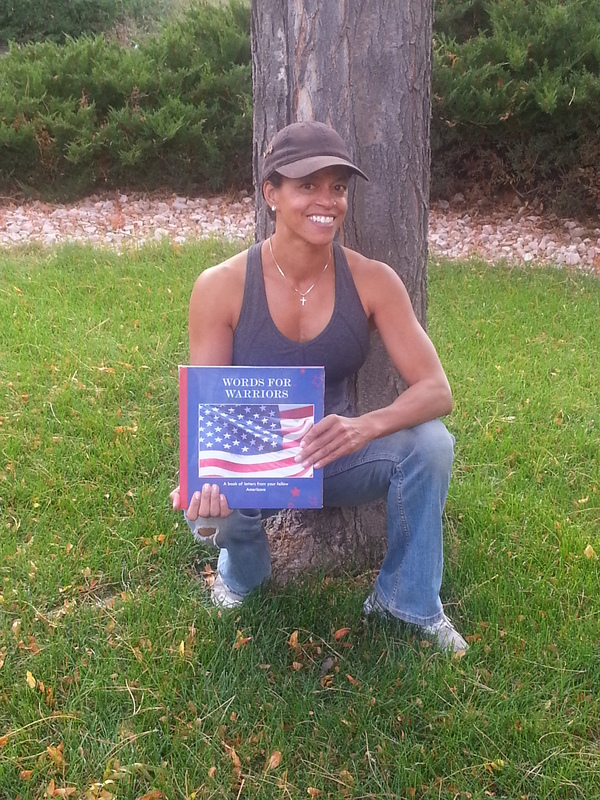 Even when I’m busy with other projects, I’m always thinking about collecting letters and distributing books to our very deserving veterans! 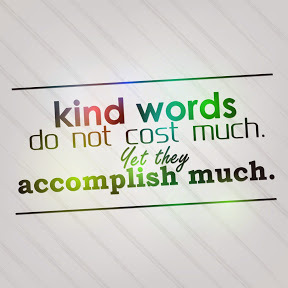 As you go about your day, please keep the Words For Warriors Project in mind. Let your friends know what we’re doing here and how they can participate. This book is a collaborative effort and I’m extremely proud of what we’ve created so far. Our veterans don’t ask for our thanks but that doesn’t mean they don’t deserve to know we ARE thankful for their hard work. 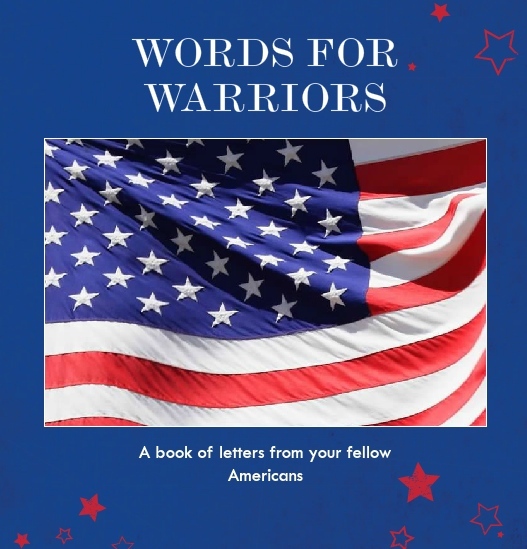 I’ve just sent out the last copy of the current edition of Words For Warriors to an Army veteran. That means I’ll start thinking about placing an order for additional books in the near future. First, I need to re-fill my cookie jar and have some jobs lined up to accomplish that goal. In the meantime, I’m going to use this lull to re-configure this website. I like some aspects of the way it looks, like the sliding banner across the top but I don’t like some of the other visuals. I’m going to play around with it…try on some new clothes, if you will, to see if I can find a template that I like the look of. As always, I’m happy to have new letters for the next editions of the book I put out. Please contribute a few lines and a photo or two. If you’ve already written a letter, let your friends know about our project. It’s an easy and fun way to make a positive contribution! I haven’t posted an update for a while but that doesn’t mean I haven’t been working on this project. I got the second edition of Words For Warriors published and have distributed many copies. Actually, I’m down to my last few. I have committed to give some of those to a wonderful organization that helps veterans seeking employment. Me with a copy of the Second Edition. I love the way it turned out. All the new letters are wonderful! I’ve handed out the majority of the newest edition to veterans I run into in my daily life. Just a few days ago there was a small group of people collecting donations for a charity outside my local grocery store. They asked if I would contribute. I wished them luck but told them I save all my extra pennies for our veterans (this project in particular). Turns out the woman seeking donations was married to a Navy vet and her son (who was there with her) was home on leave. He’s a Marine. I went back to my car, got two of our books, gave one to her son and asked her to give the other to her husband. That’s the fun part of accidental meetings. It’s a pleasure to have something tangible to hand to those who have served (and who are still serving). 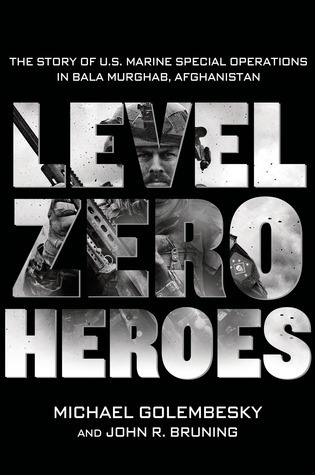 Speaking of things that please me, I was able to hand a copy of our book to a Marine veteran named Michael Golembesky and his teammate/friend J.J. Michael recently published a book called Level Zero Heroes about his experiences as a Marine Special Operations man in Afghanistan. It’s a powerful book and one you might be interested in reading. Couldn’t be happier about being able to give he and J.J. a tangible “thank you” from all of the people who contributed to Words For Warriors. I’m delighted to say that the second edition of Words For Warriors is now ready to go to the publisher. I will be double checking everything this weekend and I’ll send it off on Sunday evening or Monday morning. I like the way it shaped up. I am, of course, still happy to have any additional letters people want to send. This will be the last order of books for this year but I will publish more next year (after refilling my cookie jar) and I’ll include any new letters in the next printing. As you go about your day and you run into people who might be willing to contribute, please let them know about this project! I’m very grateful to those of you who have already taken time to pen a few lines to our very deserving veterans. Thank you. After so many years we’ve seen a lot of changes. We’ve seen a lot of battles, we’ve seen a lot of war. We’ve seen a lot of goodness, we’ve seen a lot of evil but mostly, we’ve seen a lot of sacrifice. To me, our freedom comes from those sacrifices. 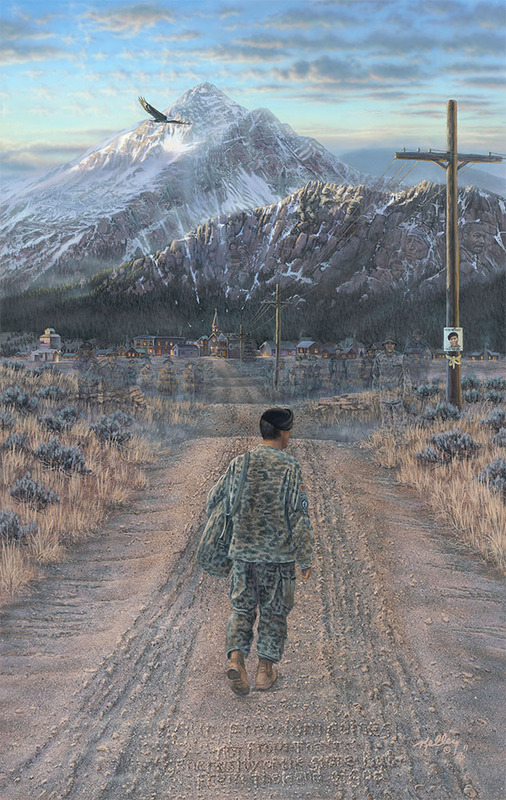 I created a painting of a soldier returning home and tried to capture the sacrifice that the soldier made. 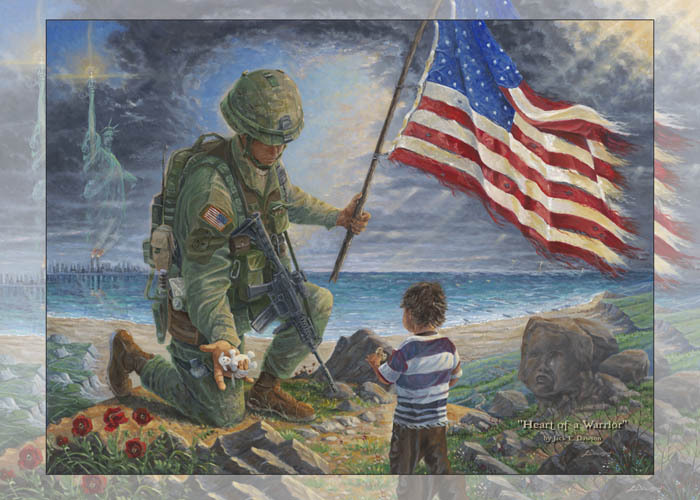 The eagle in this painting is flying over that sacrifice which was made in the name of God and country and freedom. What it’s all about is unconditional love and going beyond the call of duty which is what the world needs right now more than anything. I want the people who defend this country to know that there are people out there who care. 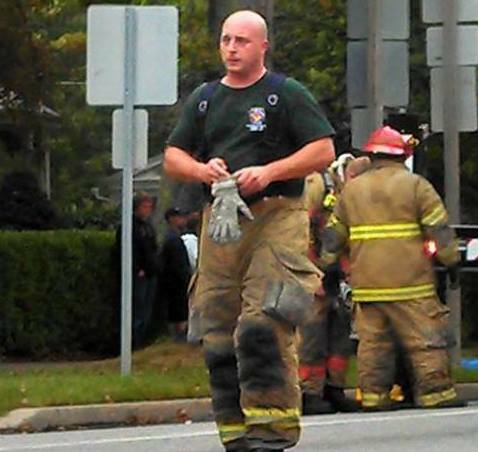 In Honor Of – Between the soldier and the town are ghosts of policemen, firemen and soldiers honoring him for fighting for what they gave their lives for. Kinship – One soldier was his buddy, wearing the same deployment patch he is. In Formation – As your eye follows the four telephone wires towards the town then beyond, you’ll see four snow lines going up into the mountains. At the end of the lines are four F-16 fighters flying in the Missing Soldier Formation. From Ashes – Between the 3rd and 4th jet are the 3 firemen raising the flag in front of the remnants of the twin towers in Manhattan. Raising the Flag – To the right of the 4th jet are the soldiers raising the flag at Iwo Jima. Defenders – On one side of the main telephone pole, in the mountain, is Mother Teresa, who gave her life to the poorest of the poor. On the other side is Dr. Martin Luther King, who gave his life defending freedom. Summit – At the top of the mountain is the American flag. In the sky is our nation’s symbol, the bald eagle, soaring to great heights over all the sacrifices in the name of God, country and freedom. When I post letters I do so because it allows readers to see what is in the books I hand out. It’s also an opportunity for veterans who might not be in my immediate sphere to read the letters that have been written to them by all of the contributors to this project. The internet posts convey the meaning of the letters but they do look much more impressive when I put them into the book with proper layout. I recently posted a letter from Logan C. He included many great photos with his letter so I had enough between the text and the pictures to create a two page layout. This is what it looks like. I’m diligently working on the second edition of Words For Warriors. It’s shaping up quite nicely and just in time! 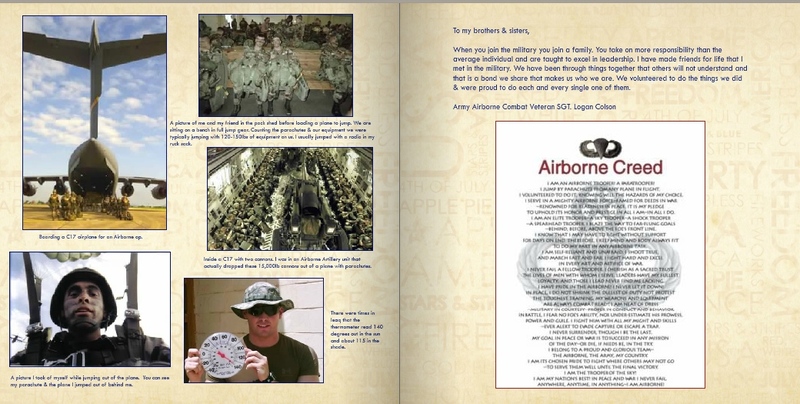 I had the opportunity to send 9 copies to a group of Army Rangers who were getting together for a summer party. I’m now down to the last couple of copies of the first edition available to distribute. Some of the letters from the first edition will appear in the second edition but many new letters will be included. I still have August 15th as my target date to send the new edition off to be printed. The second edition cover will look like the first edition cover with the exception of the color and a little notation on the spine indicating that it’s a subsequent edition. I liked the original red cover and I think the blue looks great as well. The cover of the second edition. I think the blue looks nice. Remember, if you know anyone who might like to contribute a letter to the Words For Warriors Project, it’s not too late. Please encourage them to do so! 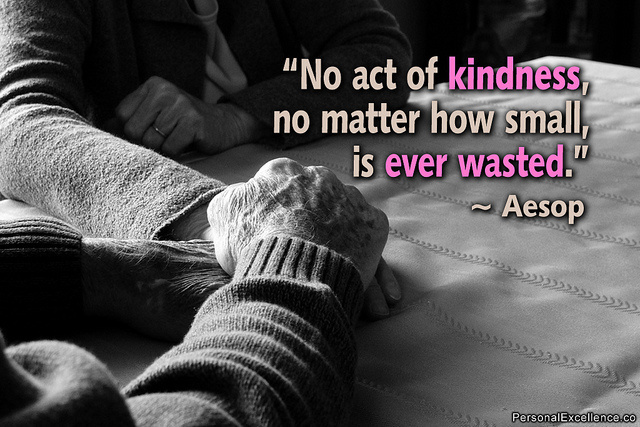 It doesn’t take much time to write a few words and you never know…it might make somebody’s day! When you join the military you join a family. You take on more responsibility than the average individual and are taught to excel in leadership. I have made friends for life that I met in the military. We have been through things that others will not understand and that is a bond we share. It makes us who we are. We volunteered to do the things we did and were proud to do each and every single one of them. 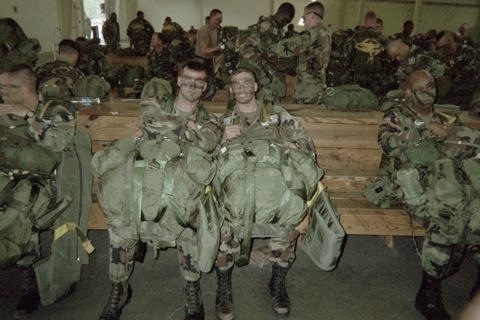 A picture of me and my friend in the pack shed before loading a plane to jump. We are sitting on a bench in full jump gear. Counting the parachutes & our equipment we were typically jumping with 120-150lbs of equipment on us. I usually jumped with a radio in my ruck sack. 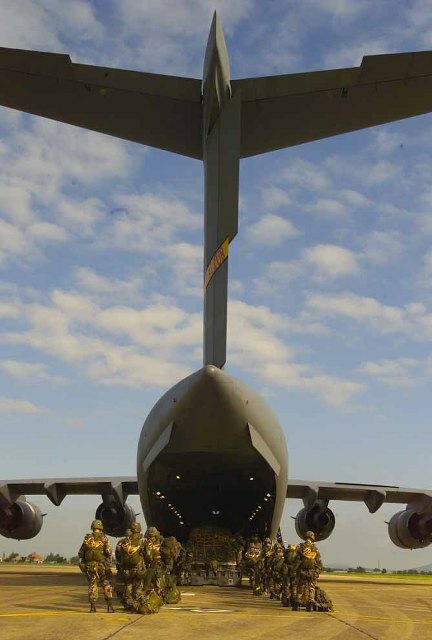 Boarding a C-17 airplane for an Airborne operation. 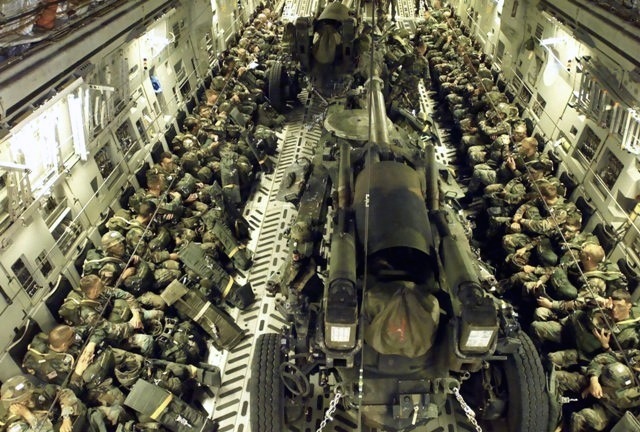 Inside a C-17 with two cannons. I was in an Airborne Artillery unit that actually dropped these 15,000lb cannons out of a plane with parachutes. 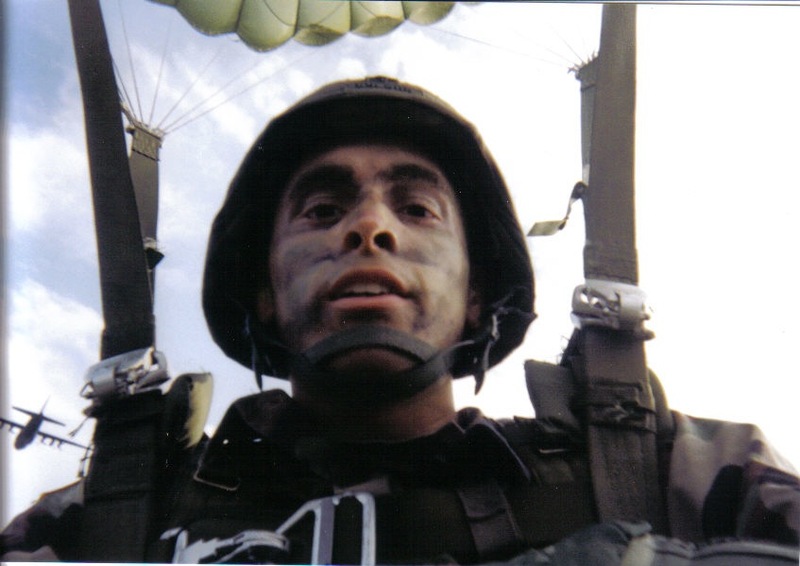 A picture I took after jumping out of a C-130. You can actually see the plane in the background. 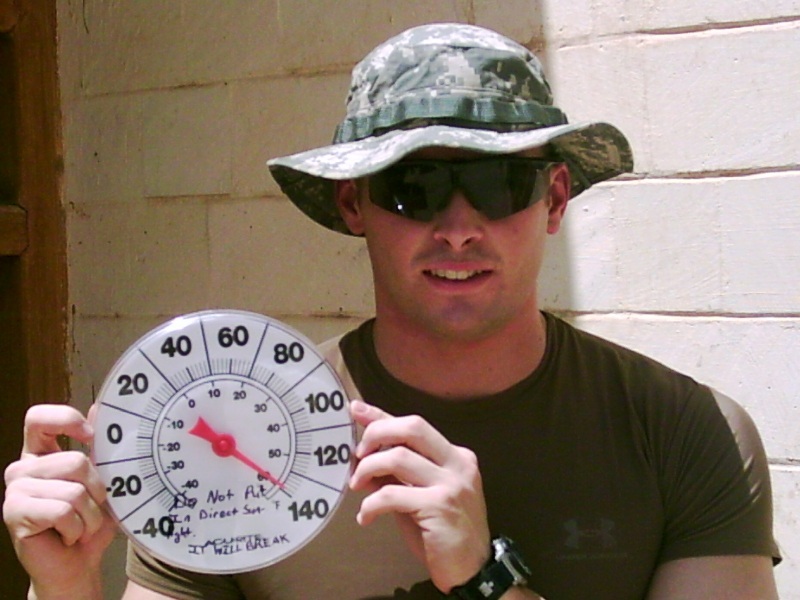 There were times in Iraq that the thermometer read 140 degrees out in the sun and about 115 in the shade. 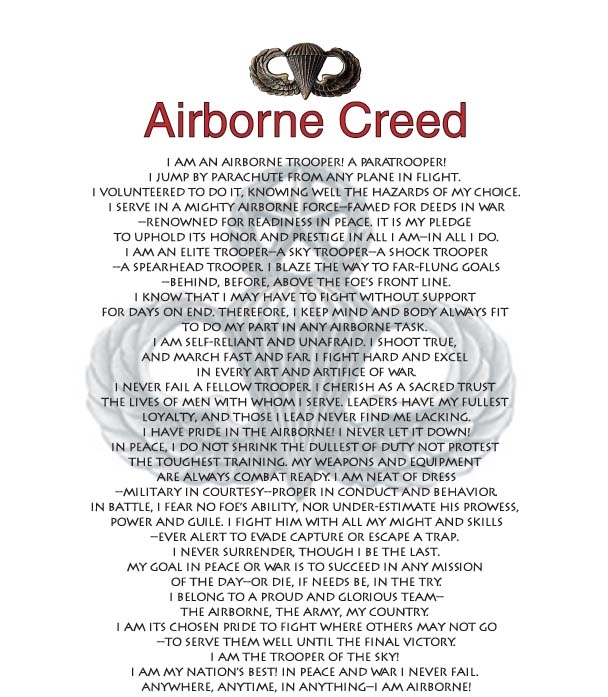 This is for all of you warriors out there who are serving our nation. I was once where you are in a very different time. I served in the first Gulf War and I consider that to have been a cake walk compared to what you are doing today. I think about the sacrifices that are made when I drive by an American flag. I think of not only you, I think of the backbone of every soldier which is their family. The family is also in the military. They are just behind the scenes. You men and women that proudly go off to a foreign country are an inspiration to all of us. The mission may be long and hard but the mission is always a success because of you. Speaking as a former service member you have millions of us soldiers in your pocket with you through our thoughts and prayers. Keep up the good work and know that I personally shake the hands of every soldier or veteran for a job well done. Thank you for what you do and remember that every day that goes by is one day closer to home. God Bless and be safe. Your country loves you. 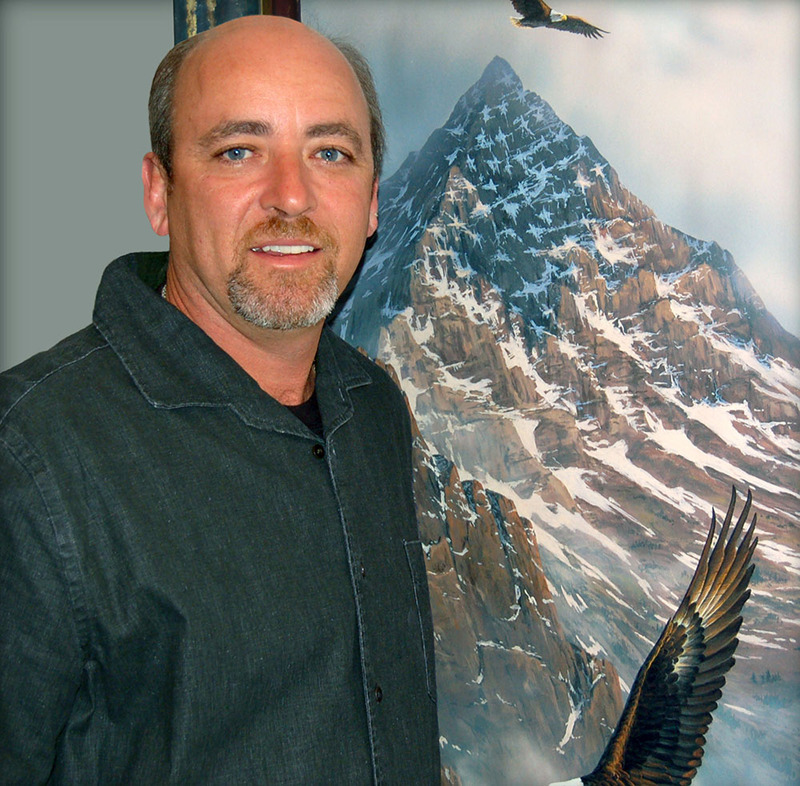 Jack Dawson is an artist who has been producing wonderful work for over 30 years. He has created many lovely pieces using various types of media. He says his “principal purpose has been to spread the message of Jesus Christ through his work.” He and his wife, have a website at http://www.jackdawson.com where you can go and see his art. I’m delighted to say that they have made a very generous donation of notecards to the Words For Warriors Project. 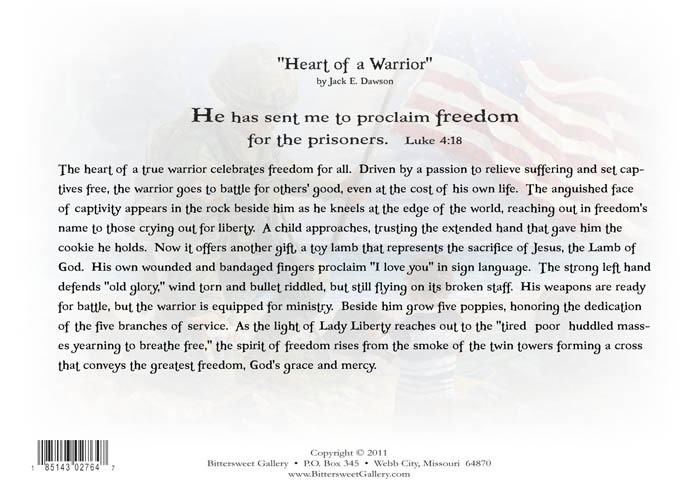 The notecards depict one of my favorite paintings of his called Heart of a Warrior and I will be tucking them into the copies of Words For Warriors that I send out. Very happy to have them. I think the recipients of the books will enjoy the little extra surprise nestled amongst the pages. Many thanks to Jack and Nancy Dawson for their generosity! This is the front of the notecards. The back of the notecard explains the thoughts behind the painting. 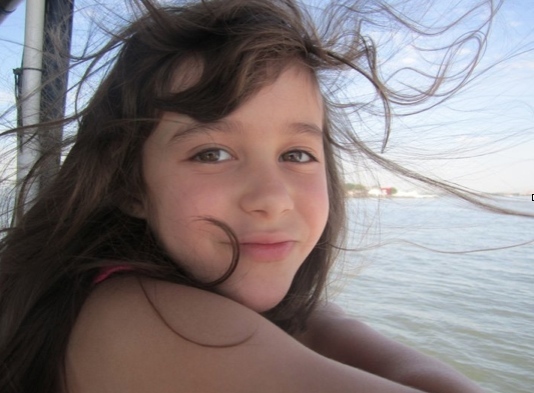 I see your sacrifice everywhere—on a nice day by the water when everyone is out with friends and family, or while putting my daughter to bed with wishes for sweet dreams and kisses to help make them come true. These are two of countless everyday moments that you sacrifice with your loved ones. And because you do this, I get to have those moments in peace and security. Thank you for all that you give up at home. 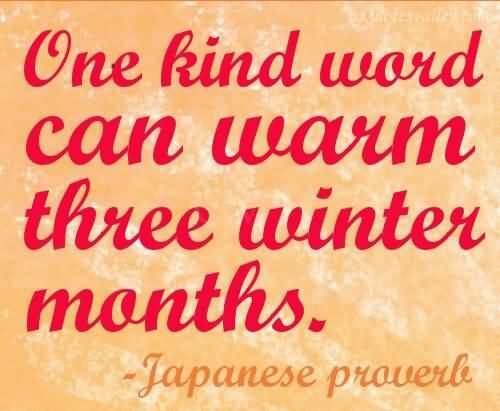 Thank you for enduring long days away filled with danger or boredom, stifling heat or bitter cold, camel spiders and other wildlife, and mostly for facing whatever the day brings with courage. Please tell your family that I thank them as well. The missing, worrying, dealing with appliances and vehicles that like to gang up and break down the moment you leave, and sending care from 7,000 miles away is not for the faint of heart. What you and your family do for the rest of us is not taken for granted. It is honored and cherished. Hopefully the words in this book will help ensure that you never doubt this. p.s. my daughter thanks you too. First and foremost, you, me and all of our brothers-in-arms, will always be WARRIORS. Never, ever stop fighting for what you believe in. Choose your battles. Choose wisely. Fold your hands and pray for guidance, then Heaven help those who get in the way, for when God is on our side, who can be against us? I can do ALL things through Christ who gives me strength – Phil. 4:13. If you are lonely…In your loneliness find strength, in your strength find humility, in your heart find God. Have a great day. Have a great life, and be the light of the world to others who are lost, for we are Warriors carrying the torch to all who live in darkness. 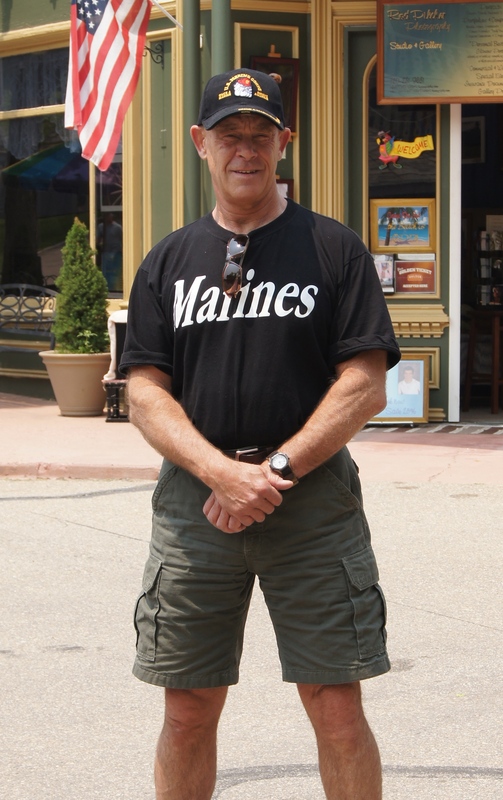 Sherm S. (I joined the Marine Corps in the 70s, did my training at MCRD in San Diego, CA, and have always lived under the principles taught in the Corps: Honor, Courage, Commitment).